Day 1/“Manas” International airport – Bishkek. Arrival in international airport “Manas”, transfer to the hotel. Rest, lunch and city tour. Bishkek – is the capital and industrial centre of Kyrgyzstan, Bishkek is a city of wide avenues, handsome buildings and Soviet heritage. The gesturing statue of Lenin can still be seen in the city’s vast central square, yet it is the permanently snowcapped Kyrgyz Ala-Tau mountain range which towers over Bishkek providing a quite stunning backdrop. We visit Manas Monument, the main national hero of the Kyrgyz people. Then excursion to the State History Museum and transfer to the main Ala Too Square to watch ceremony of changing of the Guard of Honor, main governmental buildings, and finish at the Old Square with Parliament House. We drive to Victory Square to finish our excursion visiting ZUM department store for souveniers. Day flight to Batken town. Transfer to Uzgurush villag, the drive takes us about 4 hours. Accommodation in a local Kyrgyz family house. Trekking preparation. 17 km, 7-8 hours, +1444 / -394 m. The first trekking day starts from the views of wild pistachio tree and walnut orchards. Wild trail stretches along Buldzhuma river and goes up to the pass with the same name – Buldzhuma (2894m). From the pass you can enjoy the wonderful view of the nearest gorges and the Western face of the peak Piramidalnyi and the peak Orto Chashma. After we enjoyed the views, we start descending to the valley of Ak-Tash river. There is the tent Camp Ak-Tash hidden among the bushes on a green meadow. Overnight in tents in Ak-Tash. (2500m). 16 km, 6-7 hours, +1274 / - 974 m. We traverse along Ak-Tash river on screen up to Dzhalgychy pass (3774m). 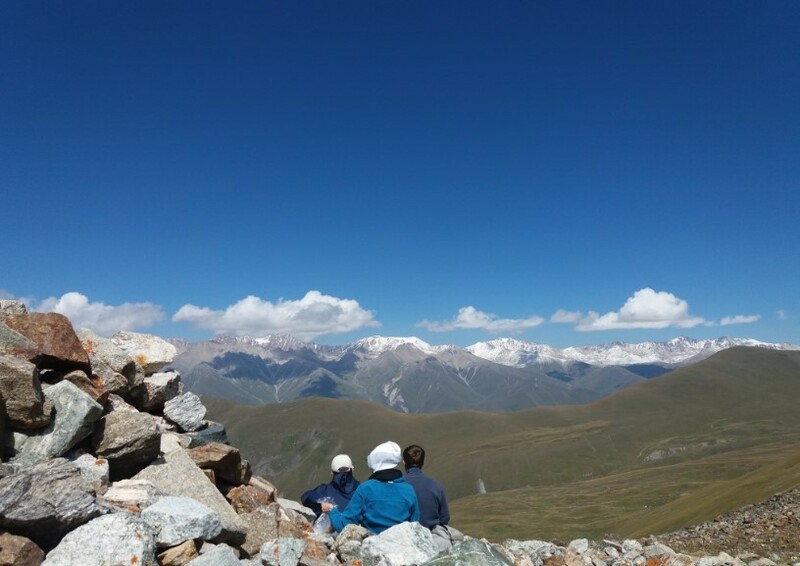 From the top of the pass we enjoy the panoramic view of Turkestan mountain range. Descend along a trail down along Dzhalgychy river till confluences with Orto Chashma river. Overnight in tents in Orto-Chashma. (2700m). 16 km, 7-8 hours, +960 m./ -960 m. Crossing Orto-Chashma river on horses, then down the water flow, on a good trail till the start of ascent to Kosh Moinok pass (3700 m). The serpentine trail goes through juniper forest, passing by a cool spring and finishes at the saddle of Kara Suu pass (3760 m). From the top of the pass we have a wonderful view of an “ocean” of pointed snowcapped rocky peaks of Turkestan mountain range. We face a row of “fortresses” of North-Western faces of the peaks Kotin (4521 m), 1000-anniversary of Kreshenie Rusi (4507 m). Overnight in tents in Kara-Suu Tent Camp». Day 6. Radial hile to the foot of Slesov peak. 10 km, 6 hours, +200 m. / -200 m. Radial hike to Ak Suu gorge towards Slesov peak. Peak Slevov (4240m) looks like a monolit rock wall when you reach it from Ak Suu gorge. This is probably who foreigners call it Russian Tower. Peak 4240 – this is the official geographic name of the peak. Alpinists from Rostov city, Russian Federation named it Slesov in the memory of their countryman, a famous alpinist Ivan Slesov. We also see peaks Orto Tubek, Ptiza, 4774, 4810. Overnight in tents in Kara-Suu Tent Camp. Day 7. Radial hike to the foot of peaks Asan Usan and Piramidalnyi. 8 km, 5 hours, + 300 m. / -300 m. Radial hike to Kara Suu gorge to the foot of peak Piramidalnyi (5509 m), 1000-anniversary of Kreshenie Rusi (Kyrkchilta) (4507 m.), Asan Usen (4378 m). An old legend says: «It was in ancient times. An old man who lived in the mountains had two sons-twins. Their names were Asan and Usen. He brought them up as warriors and was very happy with the result. What do you need more when you get old? But a war started and both sons were killed in the battles. And then the man who got out of his mind because of the grief and sorrow, rose his arms up to the sky and asked Allakh: Oh, Allakh! You give the lifes, you take them. Return my sons to me, and take my life instead. Let it be so!» And Allakh heard his pray, and the ground opened and high peaks rose up on the spot. Many centuries went on, and people call the two bastions, standing next to each other at the beginning of Karavshin river, the names of the two sons Asan (4230 m) and Usen (4378 m). A bit further you may see the snowy white peak Piramidalnyi (Tubek) (5509m) standing against the blue sky. It reminds of the old man…». Overnight in tents in Kara Suu Camp. 16 km, 8 hours, +960 m / -960 m. Over Kara Suu (3760 m) and Kosh Moinok (3260 m) passes we get back to Orto Chashma tent Camp again. This pass is very interesting: it is devided by a small flat spot in two parts. Overnight in Orto Chashma. 15 km, 8 - 10 hours, +1590 m / -1590 m. Moderate ascent along Orto Chashma river till coinfluence with Ak-Tubek river. Then we continue along Ak-Tubek river, and traverse up to Ak Tubek pass (4390 m). The hard ascent is rewarded by a majestic panoramic view over Iskander peak region and Orto Chashma river valley. Our Camp is situated in the beginning of green zone at Ak-Suu river. On the way you can see alpinist walls of Iskander (5120 m), Petrogradez (5165 m), Admiralteez (5090 m), Aksu (5355 m), A.Block (5229 m), Aktubek (5125 m) peaks. Overnight in Ak-Suu tent camp. Day 10. Radial hike to the foot of Ak-Suu peak. 14km, 5 hours, +600m/-600 m. The trail goes through juniper forest up a steep moraine to a glacier, to the very heart of Pamir-Alai – to peak Ak-Suu (5355 m). This pyramid like peak has a snow cap, and a vertical wall (almost 2 km) on the Northern slope. The grandiose circus is surrounded by such peaks as two-headed Iskander and Admiralteez, Petrogradez and A.Block. Overnight in Ak-Suu tent camp. 12 km, 6 hours, +960m/-960 m. A beautiful view opens from Uryam pass over to the neighboring gorge and a river and a amaziongly beautiful Peak called Parus (Sails) (5035m). You also can see the panoramic view of Ak Suu gorge, Dostoevskii peak (4974 m) and peak Sabakh (5300 m). Overnight in tents in Ak-Suu tent camp. Day 12. Ak-Suu – Uzgurush village. 18 km, 6 hours, -1350 m. Descent through juniper forest along Ak-Mechet river. We can observe the peak Iskander on the way. 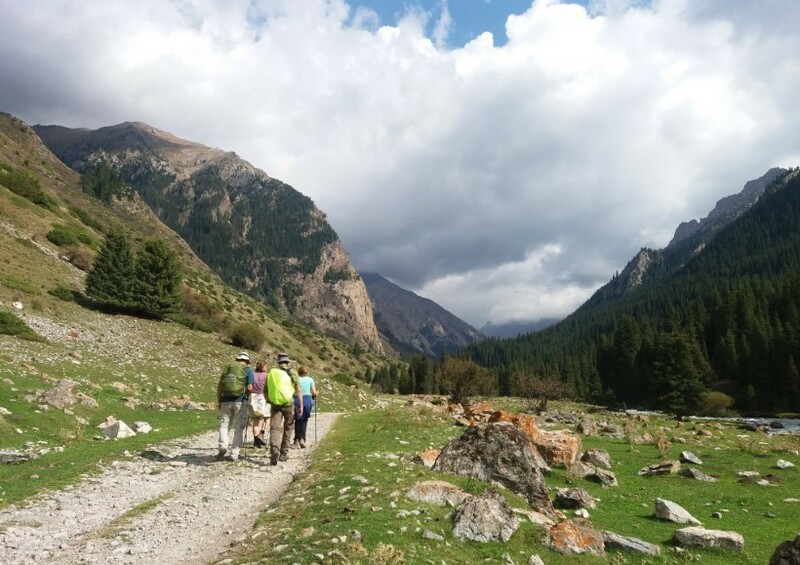 Then we trek along a picturesque green gorge till Uzgurush village. Overnight in a Kyrgyz family in Uzgurush village. Day 13. Uzgurush village – Batken town – Bishkek. Morning drive to Batken. A walk in Batken town center, visiting “Manas Ordo” complex. Afternoon flight to Bishkek. Accommodation in a hotel in Bishkek. Morning transfer from the hotel to the airport. Home flight. But still there is one significant advantage of Asian mountains from the South American analog –stable and warm weather. The mountain trails going above the steeps, wild nature, panoramic views of the canyons crowned by snow-white peaks and treks to the foot of peak Piramidalnyi (5509m), which is the highest point of Turkestan range, peak Ak-Suu (5355m), Slesova (4240m) – all these will leave an unforgettable impression on everybody!!! Itinerary: Bishkek > Batken > Uzgorush > Batken > Bishkek. The management in Bishkek airports, All transfers by car, Tour guide speaking English, Accommodations, Full board (all meals), Admissions to the museums mentioned in the program, Entries to the national park, Camp equipment rental, Rental of horse saddles for luggage Travel Insurance, International air tickets, Alcohol or mineral water, Bank transfer fees, Supplement price for single room in Bishkek and Karakol: 120$/person Additional costs not mentioned in the program. The Kyrgyz visa is required for citizens of EU, Canada, Japan and CIS. Simply provide the passport 6 months validity. The program is indicative. It is subjected to changes in the functions of flight schedules, weather conditions and other unforeseen conditions. I’m Nomad recommends you to do 8hours of sport a week before arriving. The average altitude in trekking, 2900m. The nights can be chilly, there must be adequate sleeping bags that can withstand 0C °.Provide your personal medicament because the guide has only a basic pharmacy. In strong USD rate change, we reserve the right to modify the program or price. The current rate of 1 USD = 65 KGS. According to the possibility, I’m Nomad suggests you to read the Lonely Planet guidebook. Please, contact with I’m Nomad three days before the trip ! Your personal luggage during the whole trek is carried by the animals of stablemen who accompany your group. Your luggage shouldn’t be more than 15 kg per person. For 1kg extra luggage you pay 6 USD per program (not per day!). Hope to see you in the Land of Nomads!The team of I’m Nomad ! 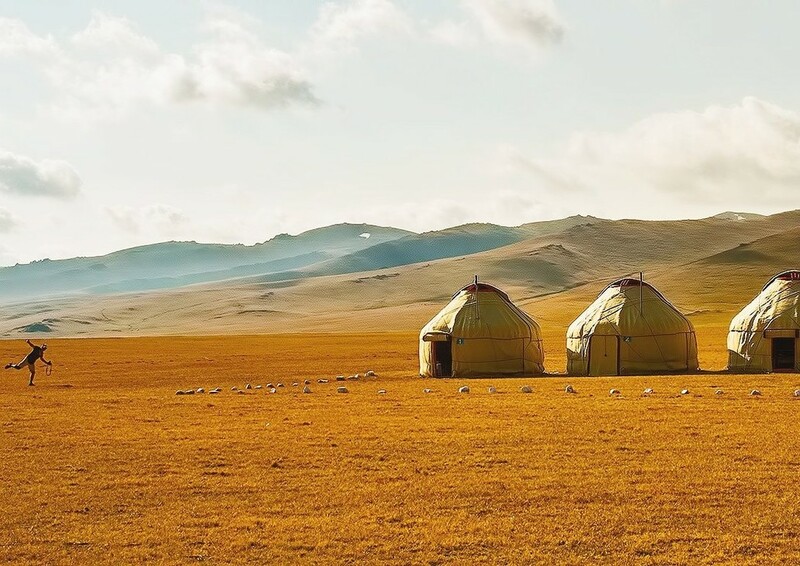 I’m Nomad invites you to explore the unknown region of the Central Asia.